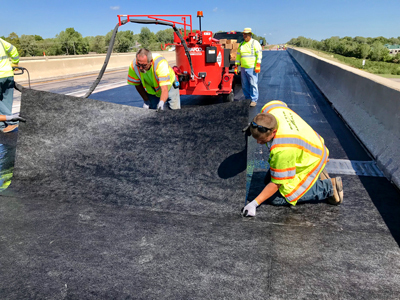 A joint project involving Crafco customers has received an Excellence in Partnering Award from Kansas Contractors Association (KCA)/Kansas Department of Transportation (KDOT). Bestowed at KCA’s annual Awards Breakfast, this distinction recognizes superior collaboration in construction planning, design, and execution. The winning project was a bridge deck preservation and test initiative involving multiple entities, including Crafco customers HAMM Companies, Bettis Asphalt, and KDOT. The teams used Crafco Ultraseal 3750 as the bridge deck waterproofing membrane. The KCA/DOT Excellence in Partnering Awards competition is open to member organizations across the state of Kansas. Its 12-person Partnering Committee judges projects by their processes, complexities, and challenges. Just 13 awards are given each year, making selection highly competitive. The Ultraseal bridge deck waterproofing project received one of two honors in District 1 — ranking as top choice in the “under $1.5MM” category. All participating contractors and KDOT were noted in the honor. Crafco’s Ultraseal Waterproofing System is designed to protect pavement surfaces from chlorides, water penetration, and other harmful materials. Its liquid formulation conforms to all surface irregularities and cracks, while its self-leveling ability makes it easy to install. Because of its proven performance, it is used by contractors, agencies, and DOTs across the nation.